Displaying 25 - 28 of 122 sketches (page 7 of 31). The original paper pages for these sketches are available as PDFs: 1959, 1960. The observations cover a period from April 18, 1959, to September 14, 1959, opposition being on May 18. In addition to drawings, work was done on the Jovian satellites, and a large number of central meridian transits were timed. Results of these latter programmes will appear next month. Surface Features. The above diagram shows the standard nomenclature which will be used in this report. The north and south components of the SEB and NEB are denoted by the addition of a small "n" or "s". 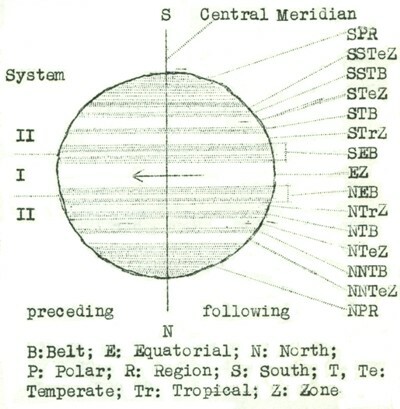 It should be noted that all the belts in the diagram are not necessarily visible during any one particular apparition; in 1959 the NTB was invisible, the NTrZ and NTeZ forming one broad zone. The following table lists the belts in order of decreasing conspicuousness. It is based on 78 drawings and 1 conspicuousness estimate. Note that the EB is a very delicate band seen occasionally near the middle of the EZ, and that the NNNTB is a belt north of the NNTB. The two components of the NEB could be resolved only with moderate telescopes and very good seeing. When unresolved, the NEB has been classed with the NEBs in the table. The last line of the table gives the relative conspicuousness of the belts using an arbitrary scale.